Last Saturday, I stepped on the scale and was happy, happy, happy to see I had dropped 2 pounds from the previous week’s weigh in. However, I was now 1 pound away from where I got “stuck” 2 years ago (the last time I seriously committed to losing weight). 2 years ago, I could not, no matter what I tried, get below 172.2. I was at 172.2 for over 2 months straight before something horrible happened and the wheels fell off my wagon and I lost everything I had worked so hard for. So, I am more than nervous about how my weight loss is going to play out now that I’m so close to the stuck point I found myself at 2 years ago. Things are different now. I’m approaching weight loss in a completely different manner. I think I’m a lot smarter about things this time than I was 2 years ago. Smarter about how I’m eating that is. I had a decent workout routine with P90X and running back then. I guess I’m a little smarter with exercise too, now that I think of it. I mean, my workouts are way more varied than they were back then. 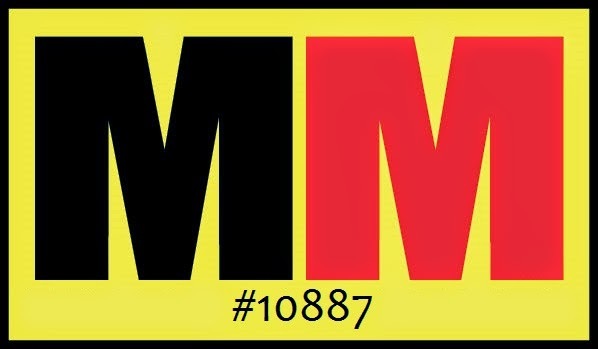 I’ve got swimming, running, cycling/spinning, 4 different strength training workouts, and getting a minimum of 10,000 steps a day. I'm going to be camping at the renaissance festival all weekend, which is why I'm posting today instead of tomorrow. I won't be counting calories, but might still be sticking with my intermittent fasting schedule (or at least a version of it), this weekend. I know that means I'm going to have to work extra hard next week to make sure I don't go up on the scale next week and I'm okay with that. This weekend is all about fun and that's what is going to happen! • Saturday: I RAN!!!! Omg, I haven’t been this happy in forever…seriously! I also haven’t been this emotional about running since I ran my first full marathon last December at the Dallas Marathon. My run started off with Ellie Goulding’s song “Love Me Like You Do” playing in my ears and yes, I wanted running to love me like it does and it did not disappoint! 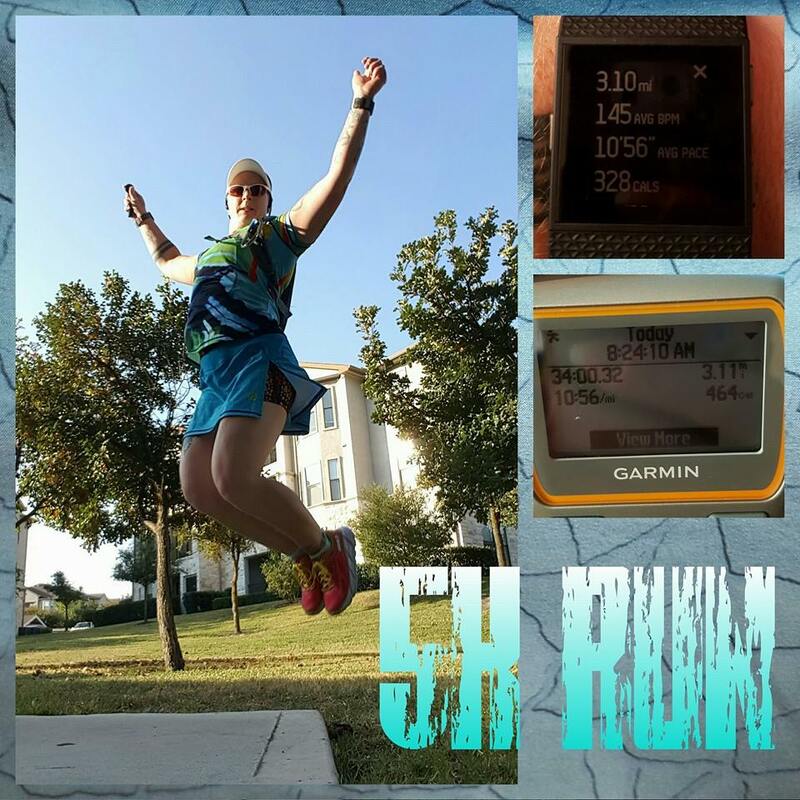 I ran a 5K distance for a virtual race I signed up for. I just ran at a comfortable pace, not pushing it at all, not trying to hit any specific time. Dude, I hadn’t ran since August 21st…no way I’m going to push things and end up hurting myself AGAIN. Not gonna happen. Or, well, I’m not going to be stupid and set myself up for it on purpose, anyway. So, needless to say, when I crossed mile 1 and my time was 11:21, I was happy with that. Then, when I crossed mile 2 and my watch beeped 11:01, I was like “whaaaaaaaat?” Then, I crossed mile 3 in 10:32. WHAT WHAT WHAT?!?!?! The final .1 of a mile was at a 10:24 pace and I am fully convinced I could have held that pace for the whole mile, if not a little faster. I just plain felt fantastic! I felt like I could have run forever. I had my FitBit set to show me my heartrate and my heartrate was steady right at 145-146 the whole run. Wow! Usually when I run it’s in the 160’s. 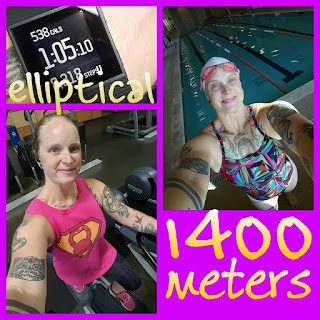 I credit swimming with this improved cardio fitness. • Sunday: I am a little sore from Saturday’s run, but I knew I would be. It’s not too much to keep me from doing what I have scheduled for this day, workout-wise. Now that I’m back at work this week and also now that running is back in the game, I’ve dropped swimming to just once a week. I still will add 100 meters each week until I reach 2000 meters, which is where I’ll keep it at. This week’s distance is 1400 meters. Got that done in 37 minutes. But, before I did my swim, I decided that I wanted to do more cardio than just swim, so I hit the elliptical for an hour + 5 minute cool down! Awwwww yea! 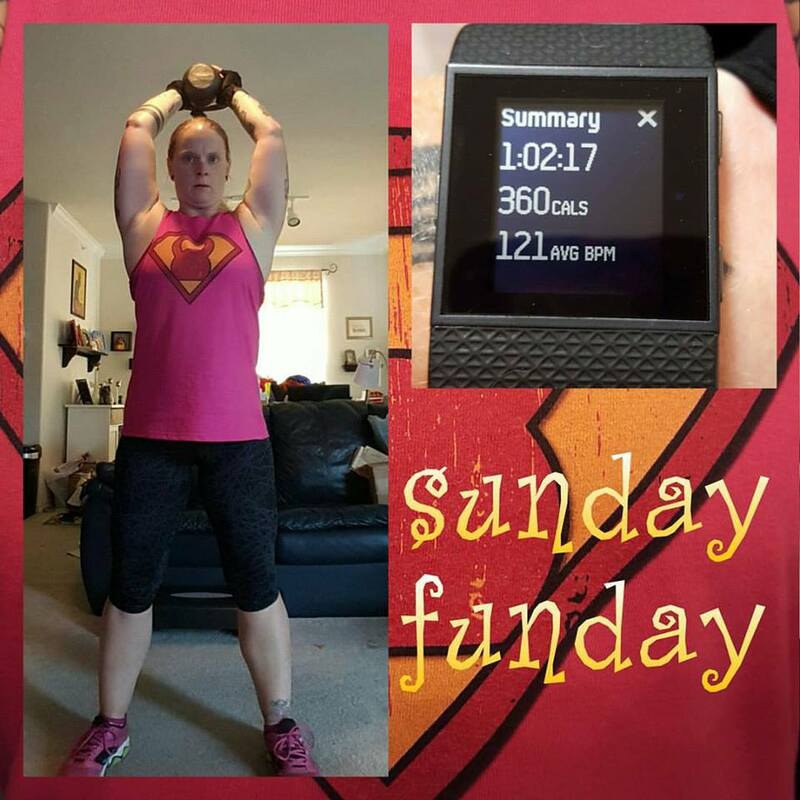 This is Sunday, so it is, of course, FUNDAY workout time!!!!! • Monday: back to work today. I had to make sure I got up early enough to get all of my working out that I wanted to do done, so I set my alarm for 6:30am. I did a little multi-tasking while drinking my pre-run coffee. I needed to bake the spaghetti squash for my dinners for this week, so I prepped them and stuck them in the oven for an hour. I’m not used to getting up that early and the sun didn’t even start to come out until around 7:30. Geez. I ran 5 miles and it went great! 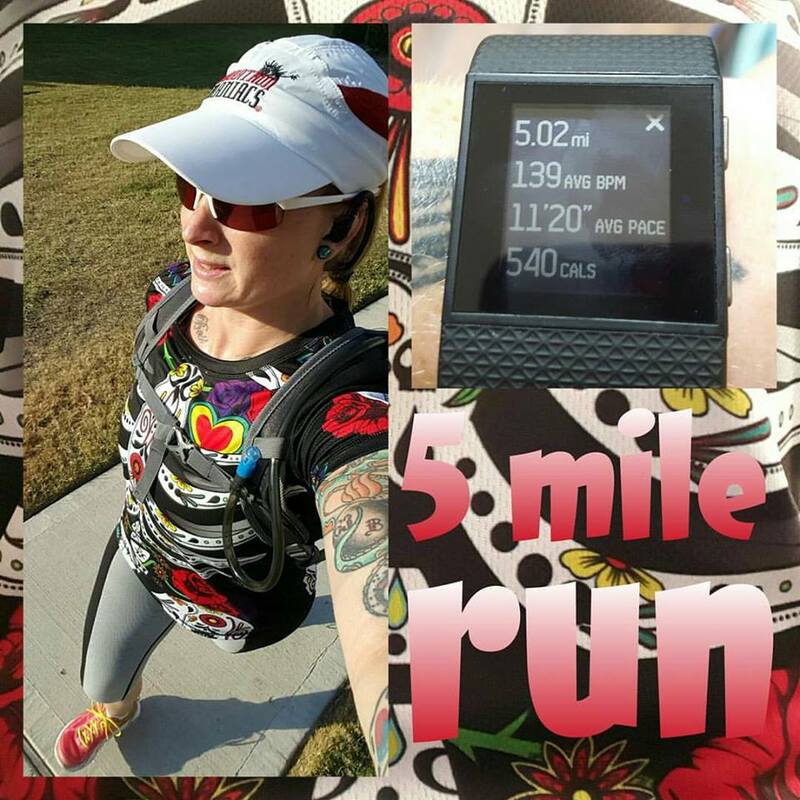 My Garmin was on crack for the first half mile and said I’d already run a mile…in 5:57 minutes. Yea, right. I’m not an elite, or a borderline elite, runner. My FitBit said I did mile 1 (the whole thing) in 11:37. That’s more like how I run. 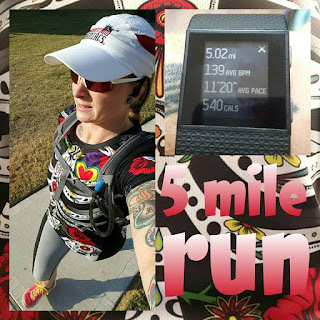 After “mile 1” (according to the Garmin), it tracked accurately, but because it tracked mile 1 incorrectly, it said my total distance was 5.49 miles when it was actually only 5.02 miles. Hopefully it doesn’t hiccup again. But, if it does, that’s one reason I double up on my activity trackers! 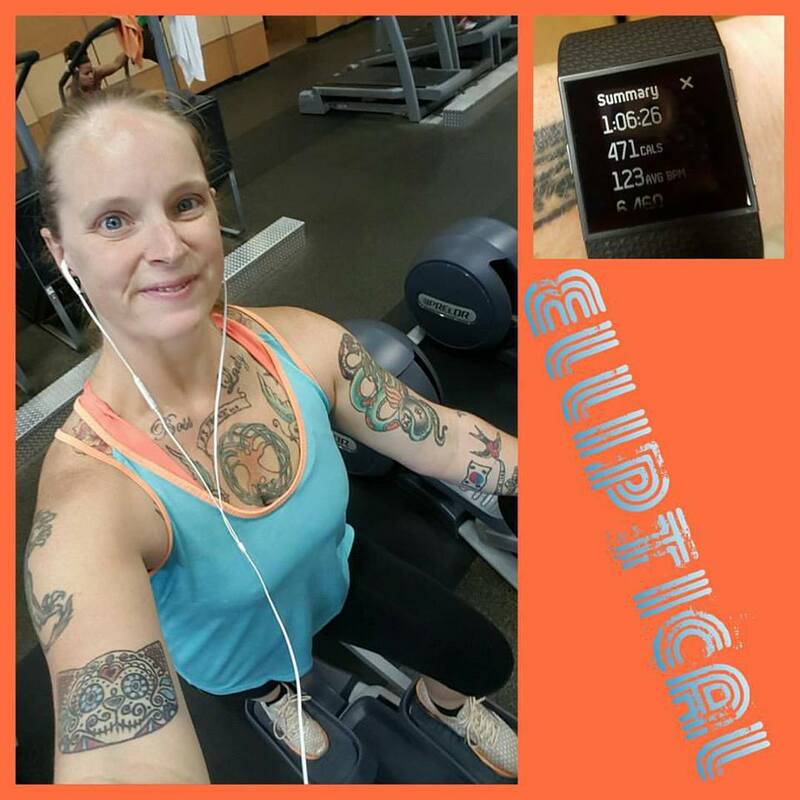 After the run, I spent a minute uploading my data and doing the Instagram collage for it, changed my shoes and then headed to the gym for my freestyle workout. 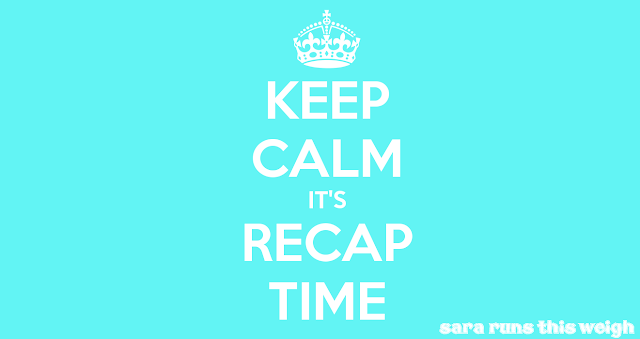 I did everything except for the BOSU lunges and the woodchoppers on the cable machine. I almost nixed the BOSU squats as well, but decided I really did need to do at least those, so I did. But, really, my abs and my legs were toast. 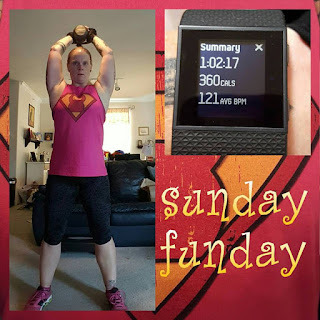 I still had a great workout and the BOSU lunges and the woodchoppers get done in the hodge podge workout as well, so I’ll just hit those extra hard later in the week. • Tuesday: therapy day…and that means walking! I had a little issue with procrastination when it came to getting out of bed this day. I kept waking up during the night and the last time I got up to use the bathroom at about 5:15am, I just couldn't get back to sleep. So when the alarm went off at 6:30 I hit the snooze and didn't get up until after 7:00. As a result I was rushed when getting ready for therapy and work after I got home from the gym. Strode my way to 5.2 miles in my 65 minutes on the elliptical. After that, I drove to work and parked in the garage and did my pre- and post-appointment walking for a total of 2.7 miles. • Wednesday: no procrastination allowed in getting out of bed this day! I had the 9:30am spin class on my agenda and I wanted to get strength training done as well in this visit. 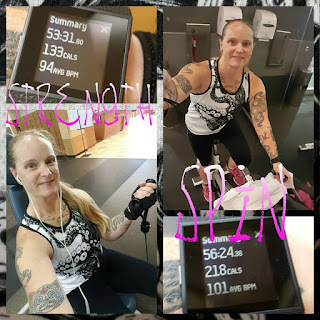 I wouldn’t have time after the spin class to get it done without being super rushed getting ready for work, so I had to do the strength pre-spin. 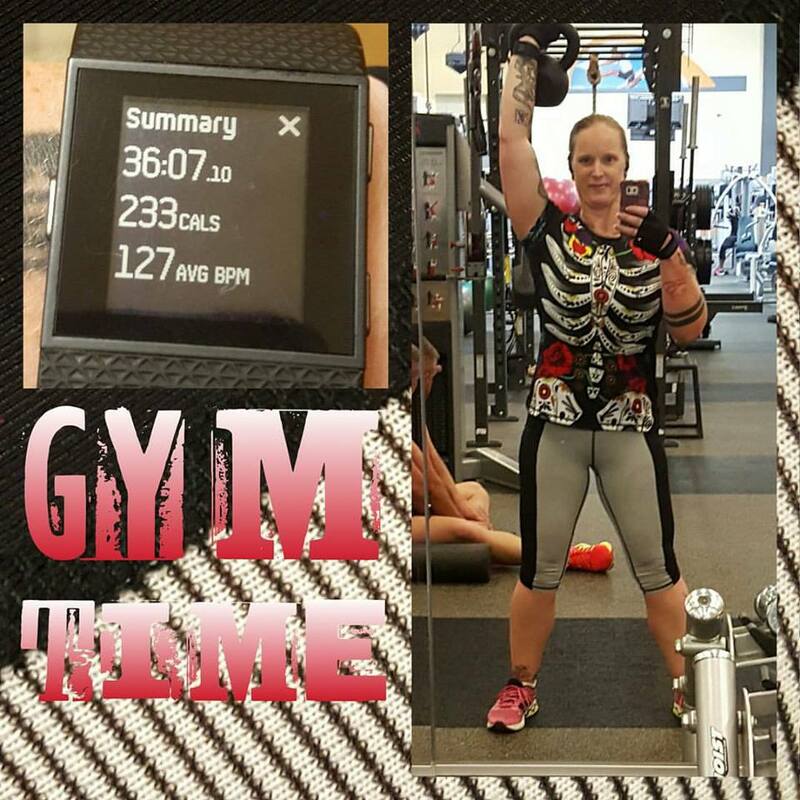 I did my machines workout and it took about 53 minutes. Then I hit the spin class! I got a bike right next to the wall mirror and I have to say I could not stop staring at myself…haha! My arms are so not flabby, which is just fascinating to me. And my legs are getting toned…also super fascinating. Oh and there’s no spare tire around my midsection anymore so I like the way that part of my body looks now as well. Also, I can watch my form better if I’m next to the mirror…haha! • Thursday: I picked up overtime at work last night, so I didn’t get to workout this day. 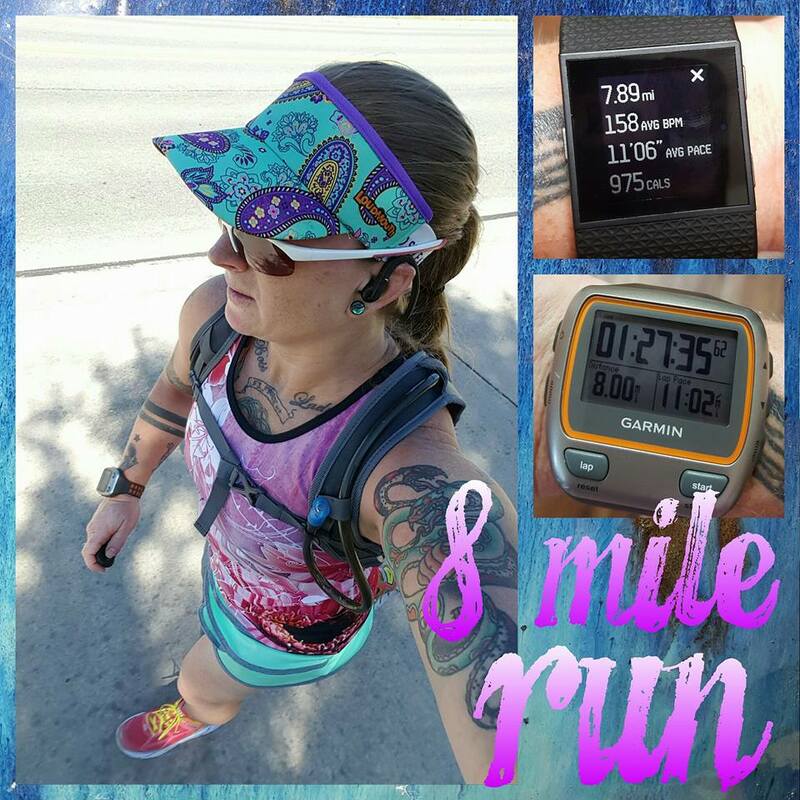 • Friday: since I picked up overtime Wednesday night and couldn’t workout yesterday, I did my 8 mile run this morning. Other than a fast mile at 10:41 and a slow mile at 11:17, all my miles were within 6 seconds of each other. Very nice. Also, while my overall time for this run was nowhere near my fastest 8 mile time of 1:22:42 from back in May, I did discover it's actually a fairly average 8 mile time for me. So that's great news! 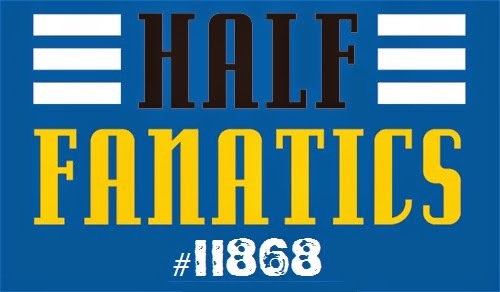 I wanted to run 8 miles today because if I can run 8 then I can run 13.1...and that's important because I have a half marathon with a 3 hour time limit next Saturday. Now I have no worries. I was going to go to the gym for my hodge podge strength training workout, but since I worked overtime Wednesday night, I wasn’t able to pack and prep for this weekend’s trip to the renaissance festival, so I just did that after my run so I could get to the campsite early enough to still have light to set up my tent and everything. Since I now have to get up earlier to workout, I’ve had to adjust the times of day for my intermittent fasting periods (fasting vs “feasting”). I’m still sticking with the 16 hours of fasting with 8 hours of “feasting.” But, instead of waiting until noon, 1pm, or even 2pm to eat breakfast, I’m eating breakfast around 10am, or after I’ve wrapped up my workout, whichever is later. That means I’m done eating by 6pm, which is great in my opinion. This will only maybe be an issue for me when I work a double shift, but I’ll just have to load myself up with water to keep the “hunger” at bay (because, let’s be honest, it won’t be TRUE hunger…it will be the “hey I’m awake so I should eat” kind of hunger). Eating went pretty dang well this week! I had no issues with being hungry or snacky or food anxiety after the end of my “feasting” period each day. Wednesday when I worked the double shift was a little tough but not because I was hungry, because I was so ridiculously tired. Holy cow was I tired. I had so much coffee that I had a horrible case of heartburn. Ugh. But I was fine as far as food went. Around 4am is when I was struggling with a little hunger and the only thing that kept me out of the donuts was the heartburn I already had and knowing it would just get worse, way worse, if I caved and had a donut. So I didn’t. It wasn’t even that hard to resist. Seriously. The biggest problem was that I was awake for basically 24 hours and then I was only able to get about 4 hours of sleep, if that, thanks to the construction going on in the lot next door to my apartment complex. Also, I’m not going to lie, I ate some Halloween candy last night at work. I’m weighing in today, Friday, because I’m heading out of town as soon as I publish this post and will be spending the entire weekend camping at the Texas Renaissance Festival with friends! It’s going to be a whatever I want to eat weekend, but I’m not going to go overboard. I’m going to most likely stick with my intermittent fasting schedule and not eat before 11am and after 7pm. There will be a post entirely dedicated to the renaissance festival weekend later next week and all the fun we had! OH. MY. GAWD. You guys! I busted through the “stuck point” I stalled out at during my last serious weight loss effort 2 years ago. 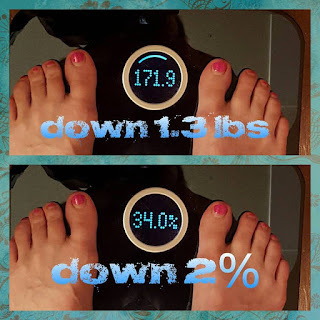 At that time, I could not get the scale to move below 172.2 (which, since the FitBit Aria scale weighs me in .4 lb higher than that scale, it would be 172.6 on this scale) no matter what I did. Seriously. No. Matter. What. To say I was nervous coming into this week’s weigh in was an understatement. I was so nervous I was going to step on the scale and I would be at my “stuck point” yet again and then I would so frustrated. Any one of you that have busted through a point where you thought you would have trouble will understand my excitement and happiness with this. • I weighed in at 171.9 lbs with a body fat of 34%! 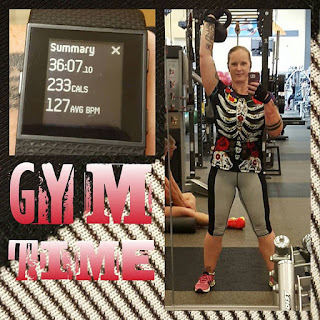 • I lost 1.3 lbs and 2% body fat! • I lost 3.9 lbs of FAT! • I gained 2.6 lbs of MUSCLE! I’m gonna say it again: OH. MY. GAWD. You guys! This is the most epic week of my weight loss adventure! Hands down!